1. I love to cook but not bake. The ants attack in The Naked Jungle (1954). 3. The week I was first nominated for the Liebster Award, we had a hot water pipe burst and were living with high power fans. We couldn't hear each other across the kitchen table. My ears were ringing for several days after they turned them off. 4. I became a playwright, well kind of, this year. We didn't have funds for royalties--nor the time for students to learn the amount of lines for a longer play--so I brainstormed with our drama students and wrote the play they performed. 5. I saw Paul McCartney this spring! We were in the (expensive) nosebleed section, but it didn't matter--we were in his presence!!! 6. After my mom visited last summer, I became a coffee addict. Each morning now begins with a cup of coffee. 8. I love board games. We have a game night once a month with family, and I keep in touch with out-of-town family via virtual games. I finally beat my brother in chess online and won a trivia game during our last game night! A pic to remember. Who knows when this will happen again? 9. I'm going to Vegas for a mini-family reunion this summer. 10. Whenever someone asks me about my kids, I have to get clarification. Do they mean my students or biological offspring? 11. I am guilty of being a series 'shipper. 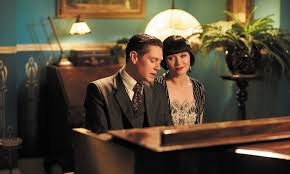 Right now, I am obsessed with Phryne Fisher and Jack Robinson of Miss Fisher's Murder Mysteries.